Guido Pella and Lorenzo Sonego score upset victories to move on. World No. 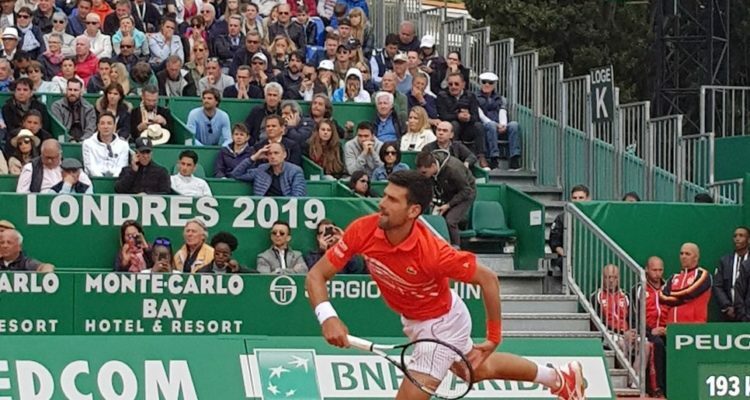 1 Novak Djokovic began his pursuit of a third Rolex Monte-Carlo Masters title when he took on Philipp Kohlschreiber under cool (14º Celsius), mostly cloudy skies covering Court Rainier III Tuesday afternoon. While the 35-year-old German veteran won their most recent meeting at Indian Wells, in straight sets on a hard-court surface – and was looking for his 20th career win in Monte-Carlo – Djokovic had been the master on clay in their previous head-to-head meetings. This time, Djokovic fought better than he played. The frustration and emotion showed on his 31-year-old face throughout much of the two hour and 36 minute match. Serving eight double faults will do that even to the best of champions. The two-time Monte-Carlo champion Djokovic overcame a second-set letdown, in which his serve was broken four times, and finally won on his fifth match-point opportunity, 6-3, 4-6, 6-4, after Kohlschreiber hit a backhanded return long. It was Djokovic’s 14th victory in 17 matches this year and the 850th tour-level win of his career. It was also the Serbian’s third win in four tries on clay against Kohlschreiber – and ninth overall in 11 matches. Once victory was secured, Djokovic emphatically whacked a ball high into the stands for a souvenir. Later, when Djokovic met the media, he spoke about the “ups and downs” of his match and how he felt “a bit rusty” on the court. “I had a tough opponent, of course. Philipp beat me in Indian Wells. It was a match that happened less than a month ago, so of course it was in the back of my mind a bit,” said Djokovic, as quoted by the ATP Tour website. “I thought I should have maybe stepped in and played a bit more aggressive in the second set, but credit to him for mixing up the pace and playing well. Although Djokovic was ranked 13th when he arrived at Monte-Carlo last year, he’s been ranked No. 1 five times during this ATP Masters 1000 tournament. Next, he will face either 24th-ranked Diego Schwartzman of Argentina or No. 65 Taylor Fritz of the United States in Thursday’s third round. Fritz, the only American in the draw, was ahead of No. 102 Jo-Wilfried Tsonga, 6-4, 2-0, when the Frenchman was forced to retire due to a left hip ailment. Elsewhere, Felix Auger-Aliassime of Canada won his 15th tour-level match with a 7-5, 7-6 (5) triumph over No. 79 Juan Ignacio Londero of Argentina. The 18-year-old Canadian, who converted 88 percent of his first-serve points during the one hour and 58 minute match, won on his fourth match-point opportunity. Next, the 33rd-ranked Auger-Aliassime will face World No. 3 Alexander Zverev of Germany on Wednesday as he goes after his second Top 10 win in an ATP Masters 1000 event this year. Also, Guido Pella of Argentina, who rallied from two sets down to win an epic five-setter over Marin Cilic at Wimbledon last summer, beat the seventh-seeded Croatian, again, 6-3, 5-7, 6-1, to advance to the third round. The 35th-ranked Pella improved his record on clay this year to 13-3 by breaking Cilic’s serve eight times and won 52 percent (48 of 93) of his return points during the two hour and 16 minute match on Court Rainier III. Earlier this year, Pella won his first ATP Tour title at the Brasil Open. Next, he will face No. 11 seed Marco Cecchinato. The Italian recovered from an 0-6 first-set drubbing against 36th-ranked Stan Wawrinka of Switzerland and beat the 2014 Monte-Carlo champion, 0-6, 7-5, 6-3, in one hour and 44 minutes. Qualifier Lorenzo Sonego of Italy upset No. 8 seed Karen Khachanov of Russia, 7-6 (4), 6-4, to earn his first Top 20 win in his Monte-Carlo debut. Playing just his second match against an opponent ranked inside the Top 20 (Khachanov is ranked 12th), Sonego saved seven of eight break points while improving his tour-level win-loss record to 8-6. In the third round, Sonego will face the winner of Wednesday’s second-round match between No. 56 Cameron Norrie of Great Britain and No. 37 Marton Fucsovics of Hungary. Norrie advanced over No. 58 Adrian Mannarino of France, 6-4, 6-3. Meanwhile, Pierre-Hugues Herbert of France, ranked 39th, advanced over 2010 Monte-Carlo finalist Fernando Verdasco, 6-4, 6-4. It was his first head-to-head victory over the 38th-ranked Spaniard in four tries. Next, Herbert will oppose No. 5 seed Kei Nishikori of Japan on Wednesday. After his win, Herbert paid homage to Notre-Dame as he signed the Eurosport court-side camera lens. He spelled out “Notre Dame” and accented it with a broken heart. Another Frenchman advanced as 26th-ranked Gilles Simon defeated Australian qualifier Alexei Popyrin, ranked No. 120, 7-5, 6-1. Next, Simon will face No. 13 seed Fabio Fognini of Italy. Finally, No. 9 seed Borna Coric of Croatia saved a match point against No. 61 wild card Jaume Munar of Spain in the second set and came back for a 6-7 (3), 7-6 (7), 6-4 second-round victory in three hours and 28 minutes as play wrapped up on Court des Princes well after the 8:13 p.m. sunset Tuesday evening. Next, Coric awaits the Nishikori-Herbert winner in the third round. As the tennis world will soon be heading to Roland Garros in Paris for the French Open, several past and present players shared their thoughts via social media about Notre-Dame Cathedral, which was engulfed in flames by a tragic fire Monday evening. No. 2 seed Rafael Nadal, who has won 11 Monte-Carlo singles titles and begins his quest for a 12th on Wednesday against Roberto Bautista Agut, spoke to the media on Monday: “In terms of tennis, I can’t complain much. Every time that I played I have been in a position to win tournaments. Life has been too good for me to be frustrated. But yes, at some point, even if I appreciate all the things that this sport has given me and this life has given to me, sometimes it’s tough to accept when you have problems in a row and this year since the beginning of the season has been tough. Four of the top five seeds will be in action on Court Rainier III on Wednesday, headlined by No. 2 seed Rafael Nadal, who will face 22nd-ranked Roberto Bautista Agut in a battle of Spanish compatriots. The Nadal-Bautista Agut match is third on court from 11 a.m. local time and follows No. 5 seed Kei Nishikori of Japan versus Pierre-Hugues Herbert of France, and wild card Felix Auger-Aliassime of Canada against No. 3 seed Alexander Zverev of Germany. The day concludes with No. 4 seed Dominic Thiem of Austria facing No. 50 Martin Klizan of Slovakia. Four other seeds – No. 6 Stefanos Tsitsipas of Greece, No. 10 Daniil Medvedev, No. 13 Fabio Fognini of Italy, and No. 16 David Goffin of Belgium – are also in action. This entry was posted in ATP Tour, ATP Tour News and tagged ATP Tour, Monte Carlo Rolex Masters, Novak Djokovic.